“Lifelong learning.” It’s all the buzz. But what does it mean? Get more degrees? Read incessantly? Seminar after seminar after seminar? More important, how do you do it? Lifelong learning is made up of 4 slices. We create learning for each. Formal, traditional education forms the base of your lifetime learning. From compulsory to advanced, formal education provides the platform to launch a learning lifetime. Or it should, anyway. Diplomas, degrees and sometimes certificates (like the GED) make up your formal education. Many people also believe that “formal” education is the same thing as “complete” or “finished” education. Big mistake. Life changes too fast. Opportunities and jobs disappear in a cosmic eyeblink. And new ones appear just as quickly. 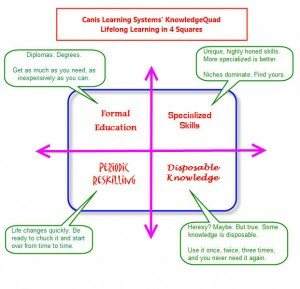 Your formal education is only one component of a learning lifetime. There is plenty of good evidence to suggest that it’s not even the most important. It may not seem “fair” but it’s the way things work. Always have, always will. If you followed the point above about finding and mining your own specialized niche, you’ve just got to know: as soon as you develop a highly specialized and valuable niche, somebody else is going to want in. So you’ll have to create another. Then another. Then another. It’ll never end. That’s the nature of life in the Learning Age. Get used to it. 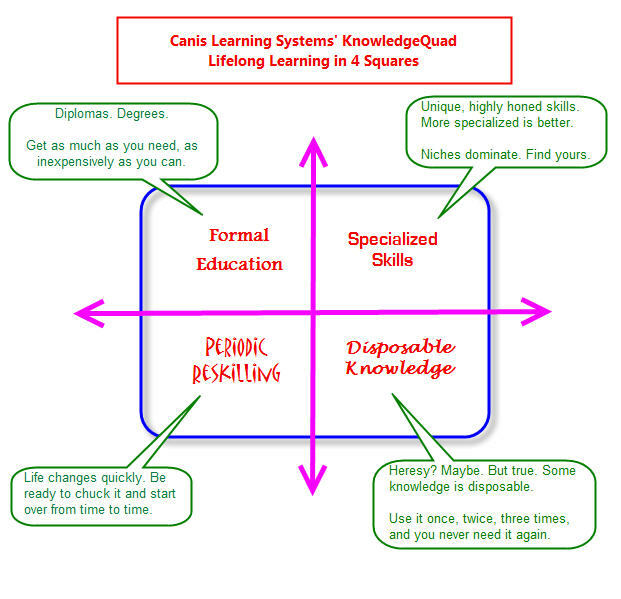 We build learning systems in each of the 4 quadrants of a great learning life. Our mission is to create a lifelong “learning system” that meets the needs and demands of the Learning Age. Previous PostPrevious Learn Much. Learn Fast.